This versatile house glue can be used for the direct method of mosaic tile laying. Craft glue is not ideal, however has the ability to work well with some mosaics that either lie flat or have little weight bearing purpose. If you are planning on using craft glue to mosaic a wall plaque then make sure you also use a strong grout. This would give the grout a larger role than normal - not only giving the mosaic a finished appearance, but also bonding the tiles to the base. 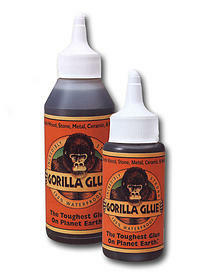 MisterArt supplies a range of craft glues including gorilla glue that would be suitable for most light-weight mosaics. For larger mosaics with heavier tiles you are better off using dedicated mosaic tile adhesive which has been specifically formulated for mosaic use.